Member Services TCS Forums Webmail Join! Mac OS X Tips and Tricks - Live! This month's General Meeting is going to be a potpourri of computing tips and tricks as presented by Bob Jarecke, the author of the Washington Apple Pi Journal's "Tips & Tricks" section. Bob will lead a live demonstration of some of his favorite computing hints. Learn new ways to move things around, find lost or missing items, and customize how your Mac looks or acts. Discover other things you'd might like to know and use to make your computing more efficient and fun. This will be a good opportunity to share some your personal hints that assist with your computing on a Mac or an Apple iOS (iPod, iPad, iPhone) device. Bob will be presiding over an informal and fluid presentation where everyone will have a chance to respond and offer other tidbits of advice. If you want Bob to cover your tip in his presentation, email him in advance and he will try to work it in. The meeting will start with the usual Questions and Answers period followed by a short update on Pi happenings. A coffee break hosted by Kitty will precede the main presentation. A sub sandwich lunch will be served up for those who will be staying for the afternoon Mobile Lifestyle SIG session. July’s meeting will be held at our usual location, the Enterprise building, Room 178 on the George Mason University campus in Fairfax VA. The main portions of the meeting will be broadcast,which means during the coffee break, the meeting will be shown as off line. If you intend to view the meeting on the Web, go to the site ahead of time and register yourself with the Ustream site. There is no cost and it will allow the meeting monitor to see exactly who is signed in and viewing the meeting. Following the General Meeting, the Mobile Lifestyle SIG will meet. Join us. Laptops and iPads welcome. The meeting will be held in Enterprise Hall, Room 178. The Sandy Creek Parking Garage is fee-based facility. It is more convenient and closer to the meeting location. The Pi will subsidize the facility's parking fee by providing vouchers for donation request of $3.00. If using the parking garage, park in Visitor's area; i.e., the lowest level. Take the elevator to the third floor (Campus Level), and exit along the sky bridge. After the meeting, exit the garage using the exits marked for Validated Tickets. Your parking ticket goes in first. Then the validation ticket goes in next. If you have any problems, there is a speaker box for calling the parking lot attendant at the checkout point. 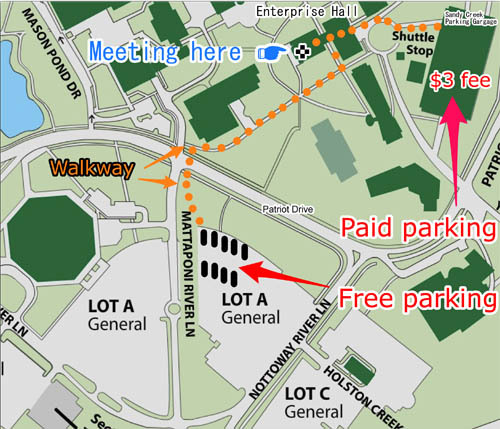 Park as close to Mattaponi River Lane as possible, then walk north along that road toward the main campus buildings. The sidewalk route takes you directly to the side of Enterprise Hall, on your left. The meeting room is located on the second floor, accessible via outside stairs or via an elevator on your right as soon as you enter the building through the doors behind the outside stairs. We will endeavor to have signs posted to help guide you to the right location. It is at least a five-minute walk from Lot A and up a slight incline. We will be using a golf cart along the route, to offer rides to those who want or need a lift. Handicapped Parking: There are three handicap parking spaces next to Enterprise Hall that can be used by members, on a first come first served basis. Have your Handicap Sticker showing on the dashboard or on the rear-view mirror.